Fast, luxurious, and stylish, with a thoroughly modern platform shared with Saab, Fiat, and Lancia, the 1988-1997 Alfa Romeo 164 could have been the hit to resuscitate Alfa’s flailing business and put the company on the map in the German-dominated executive car market. Unfortunately, it was the last model Alfa developed before falling into the arms of Fiat and it had the dubious distinction of being the last Alfa sold in the U.S. This week, we look at the 164 and its “Type Four” siblings: the Fiat Croma, Lancia Thema, and Saab 9000. The 1970s were a difficult time for all automakers, but particularly for smaller, more upscale European brands like Jaguar and Alfa Romeo. Their modest volume made for higher per-unit costs, which in turn left them very vulnerable to inflation and market fluctuations. Some small automakers could barely survive even in healthy economic times; Italy’s venerable Lancia was faced with such a mountain of debt that Fiat bought it for a pittance in 1969. The economic conditions of the seventies, of course, were anything but healthy. Skyrocketing inflation, political unrest, and energy crises hit auto sales hard, particularly in Europe. Manufacturers responded with layoffs and wage cuts, which in turn became a casus belli for the unions, whose members were already suffering the impact of inflation. The result was a long string of contentious and occasionally violent labor disputes. Originally known as A.L.F.A. (Anonima Lombarda Fabbrica Automobili), Alfa Romeo was founded in 1910. The “Romeo” portion of the name came from managing director Nicola Romeo, who joined the company in 1915. Alfa’s popularity was at its height in the late sixties, but its financial health had never been particularly robust. The Milanese automaker had been forced to seek government assistance in the 1930s, and since 1948, it had operated under the auspices of Finmeccanica (a contraction of Società Finanziaria Meccanica, roughly “financial engineering company”), a government-owned industrial conglomerate. Alfa’s sales — about 109,000 units in 1970 — were decent, but it was still at a competitive disadvantage in an increasingly difficult marketplace. Hoping to increase its volume while also stimulating the moribund economy of southern Italy, Alfa launched the “Alfasud” (“southern Alfa”) project, a new subcompact built in a newly refurbished factory in Pomigliano d’Arco, near Naples. The Alfasud was the smallest and cheapest car Alfa had offered in many years, priced a little above the popular Fiat 128 and a full class below Alfa’s existing Giulia line. With its cheerful SOHC flat four engine and clever suspension design, the Alfasud was fun to drive, but it suffered serious quality control and corrosion problems, some of them stemming from the unanticipated difficulty of training an inexperienced workforce to build an entirely new car far from Italy’s established industrial centers. The ‘sud sold well (893,719 units between 1972 and 1984), but never in the volumes Alfa had hoped. In 1978, Ettore Massacesi became chairman of Alfa Romeo with Corrado Innocenti (formerly of the aviation company Aeritalia) as deputy chairman and managing director. Massacesi and Innocenti grandly proclaimed that they would restore Alfa to profitability within four years while raising market share to 8%. The company never managed to sustain such numbers for more than brief periods, however, and continued to have far more production capacity than sales. The Pomigliano factory alone had been designed to build 450,000 cars a year, but Alfa’s annual volume was seldom much more than half that figure. An ill-fated joint venture with Nissan, ARNA (Alfa Romeo Nissan Autoveicoli), did little to help. The company continued to flounder and in early 1982, Massacesi and Innocenti laid off nearly a third of the workforce. While Alfa Romeo struggled, their longtime rival, Lancia — which, as we mentioned above, was now owned by Fiat S.p.A. and paired with Autobianchi — was beginning an affair with the Swedish automaker Saab-Scania AB. Like Alfa Romeo, Saab was a brand with a great deal of character but limited resources. The first step of the Lancia-Saab partnership was an agreement for Saab dealers in certain markets to sell the Autobianchi A112, re-badged as a Lancia. The two companies also pooled engineering resources in the design of the 1980 Lancia Delta, which sold in some markets as the Saab-Lancia 600. Saab hoped to follow its new 900 with a somewhat bigger, more luxurious model that would take it into the thick of the European executive-car market. The company had done some preliminary studies for such a car only to discover that they could not afford to develop it alone. Consultation with Lancia soon revealed that Saab’s Italian partner had similar ambitions and a common dilemma. A joint venture was the natural solution; it would allow both companies to split much of the design and engineering costs, making the new models far more economically viable. 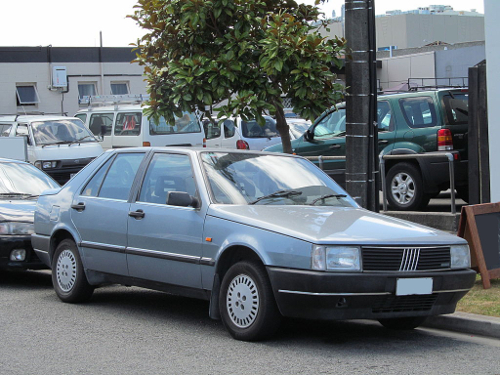 The first three of the Type Four cars were the Fiat Croma, the Lancia Thema, and the Saab 9000, all of which debuted in the 1985 model year. Giorgetto Giugiaro’s Italdesign created the basic design for all three cars, although each company finalized the interior and exterior details in-house, subject to Giugiaro’s approval. It was not a simple process, compounded by cultural and philosophical differences; Saab design chief Björn Envall was used to putting practical considerations above looks while the Italians’ first priority was aesthetics. The dimensions of all three cars were very similar, although the Saab had a slightly longer 105.2-inch (2,670mm) wheelbase, 0.5 inches (10 mm) longer than the Italians’. The Saab and Fiat were initially only available in five-door hatchback form, albeit with a traditional three-box profile that made them look like notchback sedans. (A true notchback version of the Saab 9000 was added later in the model run.) The Lancia Thema was offered only as a four-door sedan, in keeping with its executive-car ambitions. All had MacPherson strut front suspensions and four-wheel disc brakes, although their rear suspensions and engines were different. Both Saab and Fiat later admitted that the shared platform hadn’t resulted in the kind of cost savings they had hoped for. Although the structure of the three cars was similar enough that doors and other components were interchangeable, the actual number of shared components was very small. 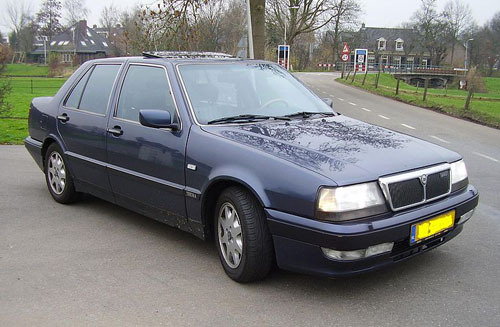 Part of the reason was that the cars were not aimed at the same market segment: While the Thema was pitched as an executive car, the Croma was aimed at the large family car market, competing with the likes of the Ford Sierra, Opel Ascona, and Vauxhall Cavalier. Saab, meanwhile, was taking aim at BMW. The Swedish company was also unwilling to compromise its traditional interest in safety, which led to some structural improvements to the 9000 relative to its Italian brethren, but further reduced commonality. Alfa Romeo engineers had been working since the end of the seventies on a new executive car to replace the big Alfetta and Alfa 6 sedans. Initially, the plan was for an all-new rear-drive car, but with the company sinking ever further into red ink, Alfa could not afford a new platform. The Type Four platform was not exactly what Alfa wanted, but it was close enough under the circumstances. In 1982, Massacesi and Innocenti decided to sign onto the Tipo Quattro project. The Alfa Romeo 164’s model name was also its internal project code. The designation soon proved to be an inopportune choice in certain Asian markets; in Hong Kong, the number 4 was widely considered unlucky because its Cantonese pronunciation is a homophone for the Cantonese word for death. After understandably sluggish initial sales, the local organization rebadged the car as the Alfa Romeo 168. As the Alfa Romeo 164 took shape, its maker’s problems grew worse. In October 1985, the Italian newspaper La Repubblica exposed an internal memorandum by Ettore Massacesi that painted a grim picture of Alfa’s financial health. By 1986, Alfa Romeo was some 2.1 trillion lire (approximately $1.5 billion) in debt and was losing money so rapidly that Finmeccanica invested an additional 615 billion lire (roughly $435 million) just to keep the automaker afloat. By early 1986, Finmeccanica was looking to divest itself of Alfa Romeo. After some noncommittal discussions with Fiat, Finmeccanica received an offer from the Ford Motor Company in May 1986. To Ford’s frustration, Fiat reentered the picture in September with a new offer that Finmeccanica accepted in early November. The Fiat offer was comparable to Ford’s — around 1.05 trillion lire (approximately $750 million) in cash in five annual installments, plus promises to assume about one-third of Alfa’s debt and make a substantial investment in reviving the firm — but Fiat was willing to take over management immediately, whereas Ford had planned to gradually increase its stake over a three-year period. The controversial and much-publicized agreement subsequently led the European Commission to investigate whether Finmeccanica had unfairly subsidized the Fiat deal. The Commission eventually concluded that Finmeccanica had not, but in 1989, the Commission ruled that Finmeccanica’s efforts to prop up Alfa Romeo prior to the sale had violated European Economic Community laws on state aid to industry and ordered Finmeccanica to repay the 615 billion lire it had pumped into Alfa in 1985–1986. 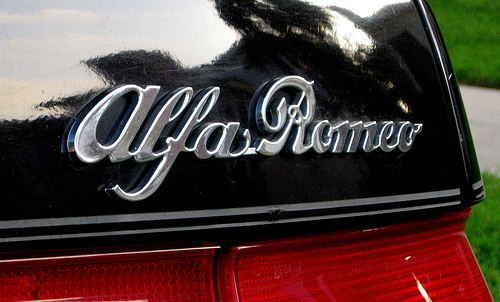 In any case, effective January 1, 1987, Alfa Romeo became a wholly owned subsidiary of Fiat. It was paired with Lancia in a new organization called Alfa Lancia S.p.A, chaired by Fiat Auto managing director Vittorio Ghidella. Fiat promised to spend some 5 trillion lire (perhaps $3.5 billion) revitalizing Alfa Lancia, but the transition was not a gentle one for Alfa. Privatization had been in essence a vote of no confidence on most of Alfa’s major management and product decisions of the past 15 years — particularly the Alfasud, which both the press and Fiat management considered to be the root of Alfa’s financial problems. (That was partially true, if overly simplistic; the Alfasud project had been a product of political and financial necessity and some of its problems had been beyond Alfa’s reasonable control.) From the point of view of an enthusiast or Alfisti, it was hard not to applaud Fiat’s stated desire to return Alfa Romeo to its traditional position as a maker of upscale sporty cars, but there was an element of vengefulness to it as well. At the time of the Fiat acquisition, the Alfa Romeo 164 was nearly ready for introduction. Its launch was delayed by Fiat management, which cited potentially serious build-quality problems. That charge was particularly ironic because Fiat’s own Type Four car, the Fiat Croma, had at best a mediocre repair record and Fiat quality control had been the subject of cruel humor on both sides of the Atlantic for many years. In any case, the 164 finally made its public debut at the Frankfurt auto show in the spring of 1987. It went on sale that fall as a 1988 model, about a year and a half behind schedule. RHD drive models for the U.K. didn’t arrive until a year after that. 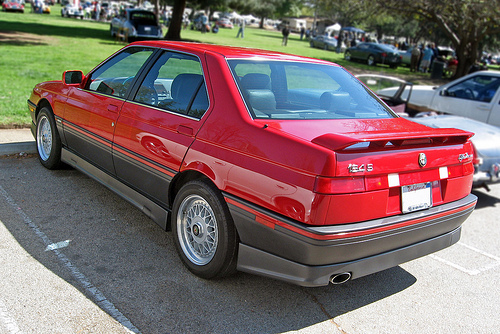 Unlike the other Type Four cars, which were the work of Giorgetto Giugiaro’s Italdesign, the Alfa Romeo 164 was credited to the venerable coachbuilder Pininfarina, although the design was mostly the work of Alfa Romeo chief designer Enrico Fumia, whose original concept had been created before Alfa joined the Type Four project. 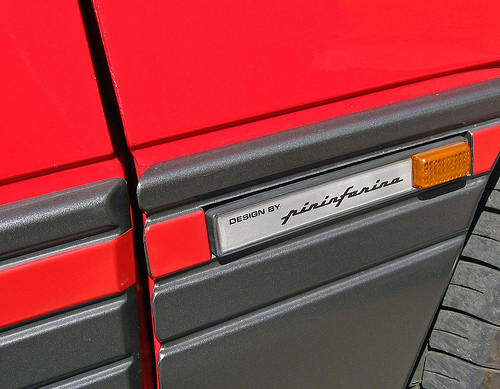 Alfa presumably opted to promote the design as a Pininfarina project because that name carried more prestige. However, Pininfarina subsequently irritated Alfa Lancia management by recycling many of the 164’s design themes for the 1989 Peugeot 605 (which our American viewers may recall from the film Ronin). Despite the resemblance, the Peugeot was not a Type Four car; it rode the same platform as the Citroën XM. The Alfa Romeo 164 doesn’t simply look sleeker than the other Type Four cars; it has a significantly lower drag coefficient: 0.30, compared to 0.34 for the Fiat Croma and 0.32 for the Thema. As with the Croma and Thema, suspension is by MacPherson struts all around (with electronic damping control for some V6 cars) while brakes are four-wheel discs. ABS was initially optional, but became standard later in the model run. Dynamically, the 164 was both engaging and quirky. It was an exuberant handler, with plenty of grip and ready turn-in, but it didn’t have the ironclad damping or unflappable composure of its German rivals. The big issue was torque steer, particularly with the V-6. Particularly at low speeds, it was easy to overwhelm the front tires with too much power, perhaps in part because the 164 was less nose-heavy than is customary for FWD cars. No one could accuse the 164 of not being involving to drive, but it was also an object lesson in why conventional wisdom prefers RWD or AWD for powerful sporty cars. Quirks aside, the 164 looked like a compelling alternative to its more staid Teutonic rivals. It was fast, nimble, well-equipped, and had tremendous character for a fairly reasonable price. Like its Lancia and Fiat cousins, the Alfa Romeo 164 rides a 104.7-inch (2,660mm) wheelbase and stretches 179.3 inches (4,555 mm) long overall; facelifted models from 1993 on were 183.7 inches (4,660 mm) overall. Not coincidentally, those figures are very similar to the dimensions of BMW’s mid-eighties (E28) 5-Series sedan — a key rival — although the Alfa is smaller than the E34 5-Series introduced in 1988. U.S.-spec 164s are relatively heavy; a V6 L like this one weighs about 3,450 lb (1,565 kg) with automatic. Alfa Romeo cars had seldom lacked charisma, but assembly quality and reliability were another matter. The 164 was mechanically robust if properly maintained, but fit and finish was not up to German standards, let alone those of the increasingly proficient Japanese. To its credit, the 164 had some of the most extensive corrosion protection Alfa Romeo had ever offered, but its complex electronics — including an LCD dash display and computerized automatic climate control — could be troublesome. Perhaps its biggest maintenance headache was the need to change the timing belt every 30,000 miles (48,000 km), an expensive task that would become more so if neglected. 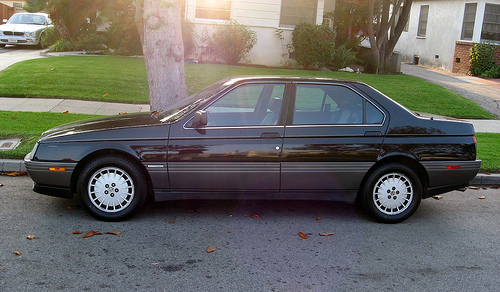 The Alfa Romeo 164 did not come to the U.S. until 1990, delayed by efforts to work out the quality bugs and also a major overhaul of Alfa’s U.S. distribution system. In 1989, Fiat established ARDONA, Alfa Romeo Distributors of North America, as a joint venture with Chrysler, hoping that Chrysler’s familiarity with the American market would help to increase Alfa’s U.S. market penetration. Chrysler soon became frustrated with the factory’s delays in introducing the new model; in 1989, Alfa dealers had nothing to sell but the dated and unreliable Milano (a.k.a. 75) sedan and the elderly Spider. Chrysler withdrew from ARDONA in 1991, leaving Alfa to go it alone. 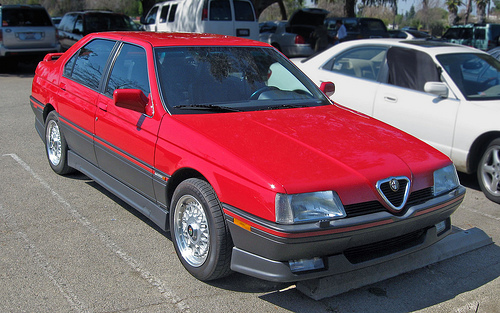 The majority of Alfa Romeo 164s worldwide had Alfa’s 1,995 cc (122 cu. in.) Twin Spark four-cylinder engine, but all early U.S. models had the SOHC V6. Base and L models had a more mildly tuned version with 183 horsepower (137 kW), while the S had 200 hp (149 kW). For 1994, these were replaced by the DOHC 24-valve version optional in other markets. In the U.S., this made 210 hp (154 kW) in the 164 LS and 230 hp (172 kW) in the sporty Quadrifoglio. It was an uphill battle. As BMW and Mercedes sales skyrocketed and Honda got into the luxury market with its Acura brand, Alfa Romeo had languished selling only 8,201 cars in the U.S. for the 1986 model year. By 1990, things were looking grim. U.S. sales for 1989 amounted to fewer than 3,000, most of which were Spiders. The slow-selling Milano was dropped for 1990, a few months before the arrival of the 164. To stay afloat, ARDONA desperately needed at least one decent-selling core product. Sadly, the 164 was not that car. Its most direct rivals in size and price were the Audi 100, the Acura Legend, and its own Saab 9000 cousin, but against those competitors, it came in a distant fourth. It was better-looking than its foes, was equally comfortable, and had vastly more personality, but it simply couldn’t match rivals’ stronger dealer networks and better brand reputations. Moreover, buyers looking to stretch a little further in price could now opt for the Lexus LS400 or Infiniti Q45, which offered Japanese reliability and V8 power. As a result, Alfa 164 sales in America were anemic. Only 1,549 were sold Stateside in 1990, 2,155 in calendar year 1991, and 1,721 for 1992. By then, Fiat was prepared to throw in the towel. Both Fiat and Lancia had withdrawn from the U.S. in the early 1980s and Fiat’s willingness to invest more money into that unfamiliar market — particularly on behalf of Alfa Romeo, which still suffered from its status as the corporation’s red-headed stepchild — was limited. Alfa Romeo held out until 1995, but 164 sales for the combined 1993-1995 period totaled only 1,484. The U.S. would not get subsequent new Alfa models like the striking new Spider, GTV, or 156 sedan. The U.S. Alfa Romeo 164S was afflicted with rather gaudy plastic body cladding, which may improve high-speed aerodynamics (although we are dubious), but does nothing for the shape. The 164S also had slightly shorter gearing to complement its more powerful engine. It was available only with manual transmission and so accounted for only a small percentage of American sales. 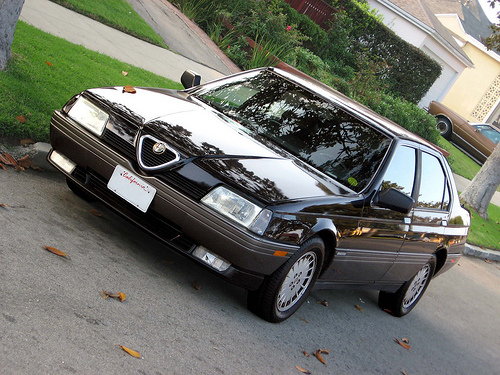 Even as its U.S. sales were sputtering, the Alfa Romeo 164’s performance received several shots in the arm. First was a new DOHC 24-valve version of the familiar 2,959 cc (181 cu. in.) V-6 with 210 PS DIN (154 kW); the 12-valve engine remained available. Second was the Quadrifoglio 4, which had a 232 PS (171 kW) version of the 24-valve V-6 and addressed the standard car’s torque steer with Viscomatic all-wheel drive, mated to a new six-speed gearbox. For the Italian market and other areas with restrictive displacement-based taxable horsepower rules, there was also a 1,996 cc (122 cu. in.) turbocharged version of the 12-valve V-6 with 210 PS DIN (154 kW). For 1994, the 164 also received a modest facelift, most recognizable by a somewhat tacky strip of anodized aluminum circling the entire car just above bumper height. None of this helped Alfa Romeo’s total sales, which sank 24% for 1993. Alfa had done reasonably well just after the Fiat acquisition, with total reaching about 225,000 units in 1989 and 1990, but by 1993, Alfa was down to 109,598 units, almost where it had been back in 1970. Alfa wouldn’t cross the 200,000-unit mark again until 1997, with the introduction of the 156. In recent years, it has again been struggling, although Fiat, to its credit, has made a great effort to preserve Alfa’s unique character. 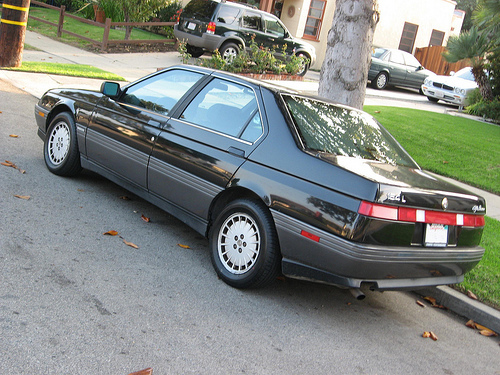 All Alfa Romeo 164S models had manual transmission. One of the 164’s problems in the U.S. market was that the six-cylinder engine didn’t mate well with the automatic transmission that most American buyers preferred. Unfortunately, the automatic positively neutered the 164’s free-revving V6, taking a serious toll on both acceleration and top speed. 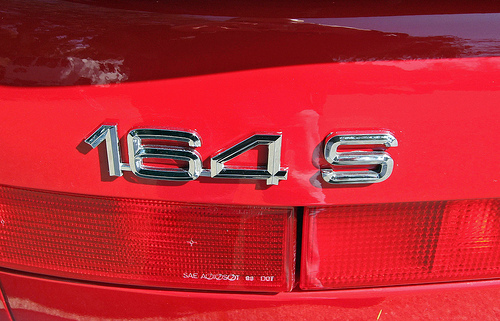 The 164 remained in production until June 1997, outliving both the Fiat Croma and Lancia Thema. Total production was 273,857 — decent, but far less than Alfa had hoped. Significantly, it was also well below the 503,087 units ultimately sold by the Saab 9000, a sign of how much the 164 had been hurt by Alfa Romeo’s tarnished reputation, limited sales network, and (in the U.S., anyway) anemic marketing. The 164’s successor, the 166, was also a disappointment. Although it had the same inspiring engines as the 164 and an even sharper suspension, the 166 suffered from dowdy styling and a generally unfinished feel. A 2003 facelift helped, but it was too little, too late; the 166 was dropped in 2007. CEO Luca De Meo said in June 2008 that a successor, the 169, would be launched by mid-2011, but as of this writing, Alfa has yet to field such a car or announce firm plans for its introduction. We consider that a terrible shame. The modern executive class is full of highly competent vehicles of decidedly mixed aesthetic appeal and about as much personality as an office furniture catalog. In such a market, cars as vivid as the Alfa Romeo 164 — flawed and risky though they may have been — are sorely missed. Our sources on Alfa’s travails included the Alfa Romeo company history from the Encyclopedia.com/Thomson Gale International Directory of Company Histories (Thomas Derdak and M.L. Cohen, “Alfa Romeo,” 2001, www.encyclopedia. com/doc/ 1G2-2844000015.html, accessed 16 April 2009); Alex, “1962-1973: Worker and student struggles in Italy,” libcom.org, 12 March 2008, libcom. org, accessed 8 August 2015; “Cash for Alfa Ruled Illegal,” New York Times 27 May 1989, www.nytimes. com, accessed 8 August 2015; Raj Chari, Life After Privatization (Oxford, England: Oxford University Press, 2015); European Commission, “Commission Demands Repayment of Illegal Aid Granted to Alfa Romeo” [press release] 31 May 1989, europa. eu/ rapid/ press-release_IP-89-403_en.htm; “Commission Extends Procedure on Aid to Alfa Romeo” [press release], 10 May 1988, europa. eu/rapid/ press-release_IP-88-289_en.html; and “European Commission Launches Investigation on Fiat Takeover of Alfa Romeo” [press release] 29 July 1987, europa. eu/rapid/ press-release_MEMO-87-86_en.htm, accessed 8 August 2015; Paul Ginsborg, A History of Contemporary Italy: Society and Politics 1943-1988 (London: Penguin Books, 1990); John Holusha, “Ford in Talks for Alfa Romeo Stake,” New York Times 22 May 1986, www.nytimes. com, accessed 8 August 2015; William Keach, “‘What do we want? Everything!’ 1969: Italy’s ‘Hot Autumn,'” International Socialist Review #67 (September-October 2009), www.isreview. org, accessed 31 October 2012; Giorgio Lonard, “‘Sforzi Insufficienti L’Alfa ‘Fuori Mercato,'” La Repubblica 12 October 1985, Sezione: ECONOMIA, p. 45, ricerca.repubblica. it, accessed 19 April 2009; Karl Ludvigsen, “Four-Leaf Clover: Lucky This Time?” NextAutos, 16 July 2008, www.nextautos. com, accessed 19 April 2009; Massimo Mucchetti, Licenziare i padroni? (Milan, Italy: Giangiacomo Feltrinelli Editore Milano, 2004); David Owen, Alfa Romeo: Always with Passion (Haynes Classic Makes) (Sparkford, England: Haynes Publishing, 1999); Don Schanche, “Fiat Will Buy Alfa Romeo, Besting Ford’ Bid,” L.A. Times 7 November 1986, articles.latimes. com, accessed 8 August 2015; Rizzo Sergio, “«Alfa, nessuna pressione. Finmeccanica renda nota l’ offerta Ford»,” Corriere della Serra 15 October 2002, p. 9, archiviostorico.corriere. it, accessed 8 August 2015; Roberto Suro, “Alfa Romeo Fight Intensifies,” New York Times 24 October 1986, and “Company News: Fiat Bests Ford in Bid for Alfa,” New York Times 7 November 1986, www.nytimes. com, accessed 8 August 2015; and Karen Wolman, “Ford bid for (Alfa) Romeo cross’d by Fiat,” The Christian Science Monitor 26 September 1986, www.csmonitor. com, accessed 8 August 2015. Information on the Type Four cars came from “Alfa Bravo (Giant Test: BMW 525i SE-v-Rover Vitesse-v-Alfa Romeo 164 V6),” CAR October 1988, pp. 94–103; Alfa Lancia S.p.A., “164” [Dutch brochure NL-891-343], c. 1989, and “Product Bulletin: Alfa Romeo 164,” c. October 1987; Alfa Romeo Distributors of North America, “Product Bulletin 164: Model Year 1991 50 State Version,” February 1990; “Alfa Romeo 155 Backgrounds,” Alfa Models.com, n.d., www.alfa-models. com, accessed 17 March 2014; “Alfa Romeo 164 3.0 Lusso,” Autocar & Motor 12 October 1988, pp. 46-53; “Auntie-Climax (Giant Test: Alfa Romeo 164 Twin Spark Lusso -v- Rover 820Si -v- BMW 520i),” CAR December 1991, pp. 82–89; “Autocar Road Test: Lancia Thema 8.32,” Autocar 27 July 1988, pp. 44-51; Yaroslave Bozhdynsky, “Interview with Enrico Fumia,” Bozhdynsky.com, 2012, www.bozhdynsky. com/cars/ interview-with-enrico-fumia/Richard Bremner, accessed 9 August 2015; “Ferraris for Four,” CAR July 1988, pp. 106-113; “Brief Test: Fiat Croma ie Turbo,” Motor 12 July 1986, pp. 22-25; “Brief Test: Lancia Thema V6,” Motor 9 August 1986, pp. 50-52; the Cars from Italy pages on the Croma, Thema, 164, and 166 (www.carsfromitaly. net, accessed 16 April 2009); Rich Ceppos, “Saab 9000 Turbo: A car for all reasons,” Car and Driver Vol. 31, No. 6 (December 1985), pp. 79-83; Jeremy Clarkson, “Pride and Prejudice,” Performance Car July 1989, pp. 74–80; James Cleary, “Starfighter,” Modern Motor September 1988, reprinted in BMW 5 Series Gold Portfolio 1988-1995, ed. R.M. Clarke (Cobham, England: Brooklands Books Ltd., ca. 1999); “Giant Test: Alfa Romeo 164 Super v BMW 530i v Volvo 850 T-5 Turbo,” CAR January 1994, pp. 98-105; “Giant Test: Fast Risers,” CAR January 1986, pp. 114-123; “Group Test: Type Four Trio,” Motor 28 June 1986, pp. 44-50; Lancia Publicity and Images, [1988 Lancia Thema 8.32 German brochure 11/87]; “Lancia Thema 8.32” [1989 Lancia Thema 8.32 French brochure]; L’Editrice Dell’Automobile LEA, L’Editrice Dell’Automobile LEA, World Cars 1973 (Bronxville, NY: Herald Books, 1973), World Cars 1979 (Pelham, New York: Herald Books, 1979), and World Cars 1985 (Pelham, NY: Herald Books, 1985); Jean Lindamood, “Björn Envall and the Saab 9000: The maverick from Trollhättan meets the toast of Turin,” Car and Driver Vol. 31, No. 6 (December 1985), pp. 85-87; Salvatore Loiacono, “Progetto Fiat Tipo: Errore nell’applicazione,” OmniAuto, 12 November 2002, www.omniauto. it; PaoloGTC, “Fiat Tipo, progetti Tipo 2 e 3, ma chi è nato prima?” Autopareri, 10 September to 10 October 2008, www.autopareri. com/ forum/ auto-depoca/ 33279-fiat-tipo-progetti- tipo-2-e-3-ma-chi-nato-prima.html, accessed 17 March 2014; John Phillips III, “Alfa Romeo 164S,” Car and Driver Vol. 35, No. 12 (June 1990), pp. 72-79; Productioncars.com, Book of Automobile Production and Sales Figures, 1945-2005 (N.p. : Productioncars.com, 2006); Chris Robyn, “Alfa Romeo 168: What’s in a Number?” Alfa Romeo 164 Home Page, 1997, www.digest. net/alfa/FAQ/164/alfa168.htm, accessed 16 April 2009; “TIPO3,” Alfa 155 Club, 4 June 2009, www.alfa155club. nl accessed 17 March 2014; Kevin Smith, “Foreigners in the Fast Lane: Seven pricey sedans undergo our acid test,”Car and Driver Vol. 37, No. 1 (July 1991, pp. 54-70; “Test Update: Fiat Croma ie Super: Good Yes, Super No,” Autocar 18 August 1987, pp. 42-45; “Tipo 4,” International Alfa Romeo 164 Register, n.d., www.alfaromeo164register. com, accessed 11 May 2013; Colin Verrilli, the Alfa Romeo 164 Home Page, 1998, www.digest. net/alfa/FAQ/164/, accessed 16 April 2009; “Versus Jaguar (Giant Test: Alfa 164 Lusso V6 v BMW 525i-24 v Citroën XM 3.0 SEi v Ford Granada Scorpio 2.9 EFI v Jaguar XJ6 3.2 v Mercedes-Benz 260E v Peugeot 605 3.0 SVE v Rover Sterling v Saab CDS 2.3 Turbo v Vauxhall Senator CD 3.0i-24 v Volvo 960 3.0i-24),” CAR February 1991, pp. 64–81; David Vivian, “All Change (Group Test: Alfa Romeo 164 Cloverleaf, BMW 530i, Jaguar XJS 3.2S),” Performance Car August 1993, reprinted in Jaguar XJ6 Gold Portfolio 1986-1994, e.d. R.M. Clarke (Cobham, England: Brooklands Books Ltd., ca. 1995); Mark Wan, “Alfa Romeo 166,” AutoZine, 27 December 1999, www.autozine. org/ Archive/Alfa/ old/ 166.html, accessed 15 April 2009; “Fiat Croma,” AutoZine, 25 May 2005, www.autozine. org/ Archive/Fiat/old/ Croma.html, accessed 3 May 2013; “Giulia leads Alfa Romeo’s revival,” AutoZine, 25 June 2015, www.autozine. org/0_News/ Archive/2015_06/ News.html, last accessed 9 August 2015; and “News,” AutoZine, ca. 18 June 2008, www.autozine. org, accessed 20 June 2008; and the Wikipedia® entries for the Alfa Romeo 164 (en.wikipedia.org/wiki/Alfa_Romeo_164, accessed 15 April 2009), 166 (en.wikipedia.org/wiki/Alfa_Romeo_169, accessed 15 April 2009) and Type Four project (en.wikipedia.org/wiki/Type_Four_chassis, accessed 15 April 2009). Although the Peugeot 605 was not a Type Four car, we also consulted William Jeanes, “Peugeot 605 SR3.0: A new executive-length tourer from France,” Car and Driver Vol. 36, No. 9 (March 1991), pp. 84-91. Renault was state-owned as well. Other government owned car companies over the years have included: Renault – nationalized after WW2 and still 15% owned by the french government. Volkswagen – started as a trust, controlled by the West German government, and the government of the State of Lower Saxony, Lower Saxony still owns 20% of the stock. Volkswagen own about 50% of Porsche… so I guess that makes Porsche 10% government owned. SEAT was founded as a state company, but now is a member of the Volkswagen group. Pegaso of Spain, once one of the most exotic car makers ever was owned by a state owned company. Proton the Malaysian automobile manufacturer that also owns Lotus is majority owned by the Malaysian government. I’m sure there are many other especially in China and the former Soviet block. Some of these companies have been very successful others not. So glad to see an article of this caliber about the 164! I owned a 1992 164-S for 8 years, between 1999 and 2007. I still miss that car, it was exactly as you describe: Fast, Comfortable, Stylish and so full of character it practically oozed awesome. Absolutely the finest thing about that car, and this is high praise as my 164 experience was overall wonderful, was the 3.0 v6. With the hot "S" cams and an ANSA tailpipe the lumpy idle and throaty WOT roar, transitioning to near Ferrari shriek at 6500 rpm was the most spectacular aural experience I have yet had in an automobile. A buddy of mine who owns and drives American Muscle cars (a ’69 GTO and a 71 Mustang with a 521 crate motor even admits it was a hell of a fine sounding ride. It also delivered power linearly, and effortlessly, returning 32mpg on the highway and turning front tires into smoke at a prodigious rate when prodded firmly with the right foot. The seats were great, the active dual-mode suspension could provide either a plush ride or the kind of nimble handling you would never expect form a heavy front drive sedan, and the materials quality was top notch simply everywhere. Alfa even made the car relatively easy to service, a major accomplishment given how tightly that wide Alfa 6 is shoehorned between the radiator and firewall. Interestingly enough, mine was also spectacularly reliable. I put a clutch in it during my ownership as the previous owner had already clocked 109K miles, and replaced the front control arm bushings three times, did a water-pump and regular timing belt changes, replaced a fuel-pressure regulator and drove it 110K miles in one year. When I sold it it had over 400K miles on it and still ran like a top. I see it on the road now and again and miss it more each day I look at the modern the replacement options. Sad and fascinating that development costs of the Type Four didn’t produce great savings for the manufacturers as, to me, all but the Alfa look as alike as numerous Buick, Olds and Chevies did to each other in the 80s and 90s. The rear doors and slope of the hood make all but the Alfa appear similar. Ironic that there seemed greater differences under the sheet metal (suspensions, Saab safety concerns) than in visual distinctions. Any idea why Giugiaro needed to approve final design details for each manufacturer? Wouldn’t it have made more sense to try to let each company differentiate its version as much as possible? You could certainly make a case that the Thema, Croma, and 900 smack of ’80s GM, where a third party (in this case Giugiaro) designed the basic structure and the individual players then had to figure out how to differentiate it within a fairly narrow set of parameters. The Thema and Croma even used a lot of the same engines. In regard to the cost savings, I think it may have been a case of trying to serve too many masters at once. Originally, the project was supposed to just be Lancia and Saab and was presumably going to be a little more upmarket. However, Fiat (which of course had owned Lancia since 1969) then decided to do the Croma, which was intended more as a mass-market sedan. (I’m not clear on how much the Thema and Croma differed in price; in the U.K. they ended up being fairly similar, but I don’t know that that was true in Italy, where a lot of Cromas had smaller engines and probably more plebeian trim.) To continue the GM analogy, I suppose it was like Buick and Oldsmobile deciding to share a new platform, only to have the corporation decide that it also needed to be a Chevrolet. Therefore, I think they ended up with each player having a lot of components that were more or less interchangeable but not the same. Fiat did learn a lot from the exercise, though, and followed it in the ’90s with the Tipo 2 program, which was a more flexible C-segment platform also shared by Fiat, Lancia, and Alfa. The Tipo 2 project resulted in the Fiat Tipo, Bravo, Brava, and Coupe; the Lancia Dedra and Delta; and the Alfa 145/146, 155, and Spider/GTV coupe. That platform had its own shortcomings, particularly for the sportier models, but Fiat did figure out how to differentiate the cars more visually while sharing more components. As regards Giugiaro, I would speculate that since he knew they were going to market the cars as “styled by Giugiaro,” he wanted to be able to approve the various changes. Björn Envall’s comments to Jean Lindamood implied that the Swedes were not particularly comfortable with that, alluding to major philosophical differences. I happen to randomly come across this article and was shocked when I noticed that the black 1991 Alfa Romeo 164L in the pictures is my car. I have to say the pictures make it look great. What a funny find and a very informative article. Thanks! I found the article excellent and impressive, mounted in a depth study. I would like to congratulate you. I am a keen admirer of the Italian cars and specially the Lancia’s though I have had 8 of them and 2 of such a kind as the ’88 Thema Tie and the ’00 Kappa T20V . I own an ’00 Y and a ’94 δ HF right now. Twice I was at front of the acquisition of the 164 without being such lucky. but also noteable unreliable and in a desperate need of a special treatment. nice article but with two mistakes, one factual and the other “debatable”. The Alfa Milano was the 75, not the 155. Unreliable as it may have been, it is considered by many to be the last real Alfa: front longitudinal engine, transaxle gearbox, de dion rear suspension, in-board rear disc brakes and parallelogram front suspension. Fully disagree: first proposal of the Fiat era has been the 155, a Fiat Tipo with Alfa Romeo badge. Front mcpherson, front wheel drive, it was a disaster. The 156 was at least better styled and with parallelogram front suspensions. But check what happens nowadays: Alfa produces only the Mito and the Giulia, which are Fiat Punto and Fiat Bravo with Alfa Romeo badge. The rear-drive, top-line always promised car never came. On the contrary, they took the Chrysler 300M platform and used it under the Lancia brand, a brand that is historically deeply tied to the front wheel drive. 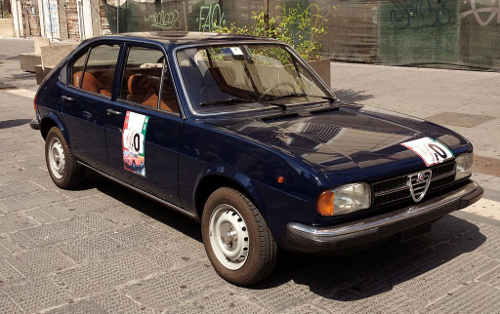 So, IMO, Fiat is just wreaking havoc on the history and tradition of italian brands. They bought Alfa Romeo because they didn’t want Ford to settle in Italy. The result is that Fiat’s market share in Italy, in 2015, was less than 25% (counting Alfa, Lancia and Chrysler too). The only car that keeps the Fiat afloat in Italy is the Panda. Thanks for the correction on the Milano — you’re right about that, obviously, and I’ve amended the text accordingly. As for the second item, at this point I would be more inclined to agree. This article was written in the era of the 156/159 and 147, which were not without flaw, but were very attractive (I think), still quite charismatic, and a definite step forward from the 155 and 145/146. (If you want to argue that the 156 and 159 would have been better with RWD, I won’t disagree, but that’s another matter.) I understand the marketing rationale of the MiTo and Giulia — the hope that the Alfa badge will be more “premium” in hopes of appealing to buyers who are increasingly status-conscious even in the C-segment — but I don’t find them all appealing stylistically or otherwise. I don’t really blame Fiat for not wanting to spend the money on a unique high-end RWD platform for Alfa and Lancia (the latter of which seems not long for the world). There isn’t an obvious marketing opportunity against the Germans and such a car would inevitably be facing so much skepticism that it would have to be really extraordinary just to be taken seriously — making it that much more of a financial risk. I believe the Fiat Croma never received the 1910cm3 engine, but only the 1929cm3 turbodiesel, and the 2500cm3 made by Sofim..and I think later the 2,0 tddi with direct injection. You may be right — my information on the Croma is admittedly spotty. Thank you for writing the article, I was informative. I was doing some research on my own car and I found out is an australian marketed 164qv series 0-164qv. The fiat group who gave me this info also have referred to it as version 953, do you know that this relates to? I’m afraid I’ve never heard that one. Alfa does have internal/project numbers, some of which are in the 900s, so it may be that. (For instance, the 1994 Spider and GTV were coded 916.) Unfortunately, I don’t have anything like a complete list, so I’m guessing. Fiat Croma / Lancia Thema’s were my favourite cars of all of times. I don’t have a 1993 options list, but my guess would be that it was a dealer-installed option, especially if it’s the same rear spoiler that was standard on the 164S. Tail spoilers were a very common dealer accessory in the nineties and when one was standard on a different model, it’s easy for the dealer to add it to other trim levels. It probably wouldn’t require anything more complicated than drilling a couple of mounting holes and, with integral brake lights, hooking up a bit of wiring that the car already probably had provision for.